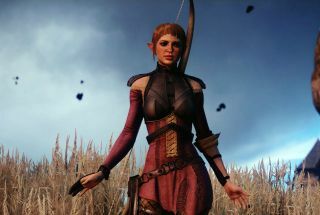 Fans of videogame music and free stuff will want to direct their attention to the Dragon Age: Inquisition website, where BioWare has put the game's tavern songs up for grabs, briefly, at no charge. There are ten tracks in total, each one short and simple, as you'd expect from a bardic ballad, but all of them quite good. As noted on the site, the songs are composed by Raney Shockne except for the first track, I Am The One, which is actually by Inon Zur. The download also includes the sheet music and lyrics to all ten tracks so that the musically inclined among you can perform them yourselves, perhaps as an entry in BioWare's ongoing Fan Celebration Contest. The Dragon Age: Inquisition tavern songs are available at no charge until February 9, at which time they'll go up for sale "on many popular digital platforms." Better to get them while they're free, I'd say.